Written and drawn by Walt Simonson, coloring by George Roussos and lettering by John Workman Jr..
My first impression when I first saw this book was of confused wonder. Who was this person in Thor's armor and how is he able to wield Mjölnir? Why is he smashing up the logo? The story opens somewhere in the vastness of space. The core of an ancient galaxy explodes and a piece of it is left in the form of an ingot of molten starstuff. Gathered by an unknown cosmic entity, we see the ingot slammed onto an anvil for molding. Shifting to Earth we find Dr. Donald Blake on a walk through Grant Park. After being accidentally hit by a Frisbee, Blake is pushed into a waiting car by some unknown thugs. The car speeds off and Blake discovers the driver to be Colonel Nick Fury of S.H.I.E.L.D..
Fury and Thor sit in an a briefing about an advanced space probe that had picked up a spacecraft and recorded the ship as it sucked in an entire star as a form of energy, the probe was then destroyed and the spacecraft is now headed towards Earth. Thor makes his way into space and the story cuts to Asgard where Lady Sif is not in the best of moods after being forsaken by Thor for Earth. Volstagg is is chowing down, Sif turns to Balder who has also fallen into some form of self loathing. Sif then turns to Heimdall in hopes of finding a battle in which she can join, but Heimdall cannot help her. Thor intercepts the ship shown in the briefing. Inside we see the ship identifying Thor as similar to the "demon breed" and targets and opens fire on him. Hurling Mjölnir, Thor breaches the ship's hull and enters the ship. Thor notices that the ship begins to self repair and believes it to be a living machine. Thor spots a large crystal beset in some machinery not far from where he entered the ship. 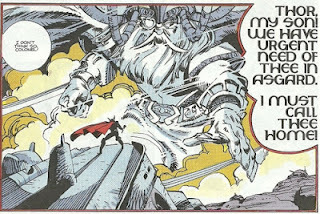 Believing that the crystal is the ship's heart, Thor approaches the crystal, the ship sounds an alarm as a giant hand punches through grabbing Thor by his head. We again cut to Asgard where Loki is seething in horrific boredom. Loki begins one of his trademark monologues when he discovers a group of warriors hunting down a troll. The hunt comes to a sudden end when the troll is tricked into being captured by Lorelei. Loki is intrigued by Lorelei and offers her to join him at his dwelling. The warriors urge Lorelei not to trust Loki but she agrees and Loki bids the warriors away. 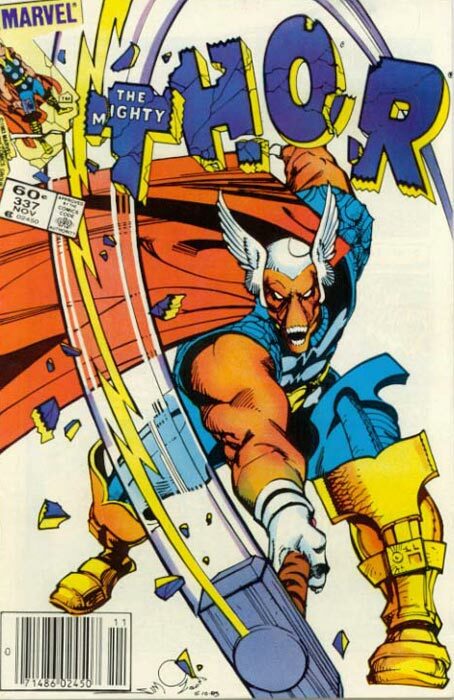 ﻿Back on the space vessel, Thor is slammed into a wall and his opponent is revealed as Beta Ray Bill. Bill and Thor engage in a fight worthy of song in the halls of Valhalla. 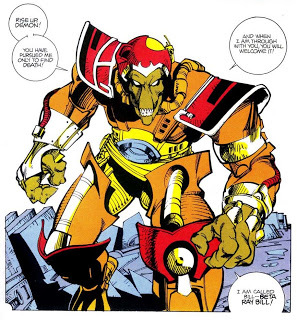 Throughout the fight Bill refers to Thor as a demon and no progress is made by either combatant in figuring out who the other is and their intentions. Thor is committed to preventing the ship from reaching Earth and Bill believes Thor to be an evil demon related to others he has fought before. 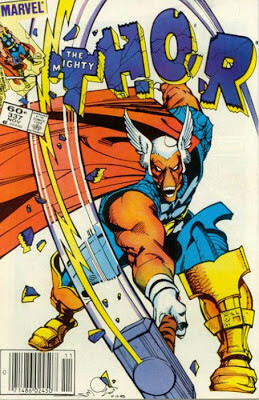 During the fight, Thor loses his grip on Mjölnir and reverts back into the form of Donald Blake. Blake gets himself knocked out by Bill as the ship crash lands on Earth. Bill emerges from the wreckage and is looking for Thor's hammer but finds only a stick. As Bill slams the stick against the ship's hull, he becomes adorned in Thor's armor and the stick is now in the form of Mjölnir. Nick Fury and S.H.I.E.L.D. agents are approaching the crash site when one of the flying cars is smashed by Bill hurling Mjölnir. Fury recognizes the hammer but recognizes that the wielder is not Thor. ﻿﻿An image of of Odin appears in the sky above and calls his son home on urgent business. Not knowing what had happened between Bill and Thor, Odin transports Bill to Asgard. Fury and his agents begin to search the wreckage and Thor in the form of Donald Blake is seen climbing the wreckage, in wind and rain, crying out to his father Odin not to forsake him. I've already stated how I feel about Walt Simson and Thor. I don't think there is much more that I could say. The run that starts with this issue is what turned me from being a Thor fan into a fanatic. I'm not sure how soon I will have the next issue up, I want to take my time with these, I'm not satisfied with doing just a recap review. As I go through each issue I'm hoping to find something more relevant, something that breaks my inability to express what I have going on in my mind. Thor #338 is the works, until then, fair thee well mortals.